Governor Terry Branstad talks with reporters. Governor Terry Branstad is mum about a big economic development deal set to be revealed tomorrow. The Des Moines Register reports Facebook plans to build a $1 billion data center in Altoona, a suburb just to the east of Des Moines. “We don’t talk about economic development prospects until the people, the company that we’re working with is ready to announce it,” Branstad said this morning. Google has invested over a billion dollars on a “server farm” in Council Bluffs and Microsoft runs a data center in West Des Moines. Iowa is an attractive spot for the facilities, with its relatively cheap and available supply of electricity. The Des Moines Register reports the site Facebook is considering in Altoona is near a MidAmerican Energy power station. Governor Branstad was asked about the Facebook project this morning during his weekly news conference. Branstad would only acknowledge it was a “big” project — and he would not say the company’s name. 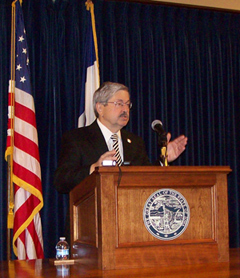 Branstad will not reveal what state incentives have been offered to Facebook. The governor told reporters to attend the announcement on Tuesday to learn those details.